Sturdy steel “C” frame construction with quick change anvil. 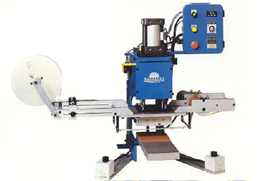 Hardened linear shafts and maintenance free composite die set bearings guide heated platen for precise stamping. Multicolor heat transfer index unit with photoelectric eye registration and D.C. drive. Versatile frame design allows this press to be upgraded from a 2.0 inch bore cylinder to a 3.25 or 4.0 inch bore when additional stamping pressure is required. The convenient quick change support anvil allows operators to set up new jobs effortlessly. Heat transfer index system utilizes a photoelectric eye sensor to register heat transfers with witness marks on the front or back of the carrier paper. Hot stamp foil can also be applied with this feature and indexed accurately with a solid state timer. Dual air pressure system allows stamping pressure to be as low as 10 PSI – while a higher pressure can be set to retract the heated head faster for increased production.